An out-of-work drifter (professional wrestling legend ‘Rowdy’ Roddy Piper) wanders into Los Angeles, looking for work and a place to stay. An idealistic individual, he believes that America is the land of opportunity, so long as you work hard, remain patient and follow the rules. However, our drifter is about to have his illusions shattered, as he soon discovers the glamorous facade of the privileged society we inhabit is a smokescreen concealing a nightmarish landscape of thought control and rigid conformity. Inspired by a short story from Ray Faraday Nelson, titled Eight O’Clock in the Morning (1963), writer-director John Carpenter’s They Live (1988) is one of my favourite motion pictures. Admittedly, it’s a pretty big deal to me that ‘Rowdy’ Roddy Piper appears as the central character of the piece. You see, I grew up watching ‘Hot Rod’ during his prime years as a wrestling star, and as far as I’m concerned, one couldn’t have found a better actor to portray the lead in They Live. Indeed, it would have been a totally different film without Piper. All of those hilarious one-liners that you hear from Piper? Many of those were ad-libbed by ‘Hot Rod’ himself. Apart from his prowess inside the squared circle, Piper was a flamboyant character whose pre-match interviews often contained stinging insults aimed at whomever his opponent was to be on the night. An incredibly gifted speaker, Piper’s verbal barbs at his foes were never scripted, and his talk show segment, Piper’s Pit, became the stuff of legend. 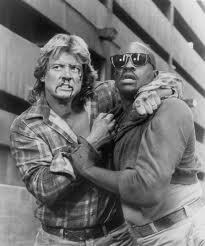 Suitably impressed by the ultra-charismatic Piper’s work in the realm of professional wrestling, Carpenter offered the Canadian-born ‘Hot Scot’ the leading role in They Live. Carpenter couldn’t have made a better choice. Casting decisions aside, They Live really speaks to me with its indictments of mindless consumerism, draconian conformism and brutal authoritarianism, all the while lamenting the demise of individualism in modern society. Granted, it’s also a work of science fiction, but the messages in the film are wholly applicable to the real world. The concrete jungle presented in They Live is littered with countless billboards, signs and posters, seemingly innocuous commercials for consumer products, but when stripped of their glossy facade, each insidious advertisement reveals a stern message, printed in severe black text, demanding that we humans obey, consume, and don’t demonstrate independent thought. Piper’s lone drifter character is understandably astonished when he makes this discovery (exactly how he manages this, I’ll leave it to the film to reveal), as he soon realises it’s all part of a global conspiracy, designed to keep “regular people” subdued and subservient to an exclusive worldwide corporate elite. Much like the world we inhabit, really. Piper’s working-class character (never named in the story, but listed in the closing credits as “Nada” and often called “John Nada” by fans of the movie, so let’s go with that) at the outset of They Live is like so many of us: the hard-working individual who believes that there is room for everyone to prosper, so long as each of us has faith in the system and follows the straight and narrow. By contrast, Frank (played by Carpenter regular Keith David) is already jaded and embittered when we first encounter him, a construction worker and family man who has really been screwed over by the capitalist machine. However, despite his dissatisfaction with the capitalist system, Frank expresses his reservations, to say the least, when the post-disillusionment Nada tries to show him the world as it really is. Frank represents another mindset common in our society, that of the individual who knows the system is designed to marginalise the many for the benefit of the few, but is hesitant to take action against the puppetmasters who comprise the corporate elite. Frank is frustrated, yet feels powerless and unable to fight the system, and understandably doesn’t want to be associated with Nada at this point, as the drifter has, owing to a violent rampage inside a city bank, attracted unfavourable attention from the police department, themselves subservient, unquestioning foot soldiers of the so-called ruling class. As you might guess, the masters of this global conspiracy as portrayed in They Live are not regular people. Again, as to exactly what they are and how they are discovered by Nada, I shall leave for the film to reveal. One of my favourite scenes in the film takes place inside a newsagency, where Nada is alarmed by the presence of a seemingly normal human whose true appearance is apparent to no one else. Take note of the book with its orange cover on the bookstand next to John Nada in the picture below. Nada, now blessed with an extra-sensory perception of his own, is able to see the world as it really is, as opposed to the world as many of us think it is. Carpenter’s They Live, much like Invasion of the Body Snatchers (1956, 1978) and numerous other motion pictures from the sci-fi genre, rouses profound feelings of paranoia, making us consider that maybe not only are we not alone in this universe, we aren’t even alone on our own planet. Perhaps the invaders are here already, living among us, controlling us without our knowledge. Such fantastic notions aside, They Live, again, similar to Invasion of the Body Snatchers and The Stepford Wives (1975, 2004), deals with the loss of our humanity, the idea of people losing their souls, their uniqueness, as they succumb to the rigidly conformist principles preached by society. Granted, the film is entirely unsubtle in its approach, and detractors might consider it redundant in the sense that it underscores the flagrantly obvious, but if the societal woes highlighted in the film are so apparent in the everyday world, why is it that so many people fail to see the world as it really is? Perhaps this accounts for the lack of subtlety exhibited by the film. Sometimes, you really do need to spell it out in bold capital letters. 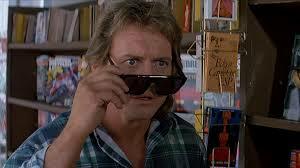 Carpenter’s They Live is a relatively obscure work in the history of science fiction cinema, and most unjustly so. Released to American cinemas during the final days of the Reagan administration (the film itself critical of Reaganism), just four days before the November 1988 presidential election, They Live topped the United States’ box office in its opening weekend, before experiencing a rapid decline in audience attendance. However, the film has become a firm cult favourite, and now twenty-five years after it first reached the cinema, They Live is ripe for discovery from a new audience. A blissfully entertaining blend of science fiction, action and social commentary, boasting a tremendous sense of humour, much of it originating from Piper’s hysterical one-liners, They Live is recommended most highly to fans of sci-fi and socially-aware cinema. Featuring a supporting cast including George ‘Buck’ Flower, Meg Foster and Raymond St. Jacques as The Street Preacher, Carpenter’s They Live is a motion picture that – its more fantastic elements aside – shows us the world as it really is. It’s a film that has become terrifyingly relevant, moreso than ever before, to our commercially-saturated, non-thinking society since its release one-quarter century ago. 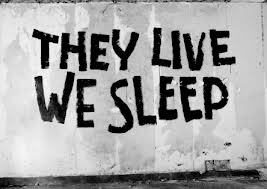 So if you think you see the world as it really is, John Carpenter’s They Live will give you cause to reconsider. 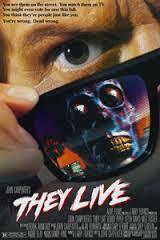 They Live screens Sunday September 1st at 7pm in a double bill with David Cronenberg’s Videodrome. Next Post Kinda Wobbly, Isn’t He? Yay! A wonderful write-up for a surprisingly smart, neglected little film. Glad to see its cult status is being acknowledged at a time the film’s themes seem more relevant than ever. Like very much how you whet the reader’s appetite for the film by pointing out so many elements that get lost in discussions about “They Live” being a genre exploitation film. For the uninitiated, I can’t think of a better-written inducement to discover this undiscovered film. I haven’t seen the film in decades…now I might have to give it another look-see!